The state has been hit with more than 230 small earthquakes since Friday. 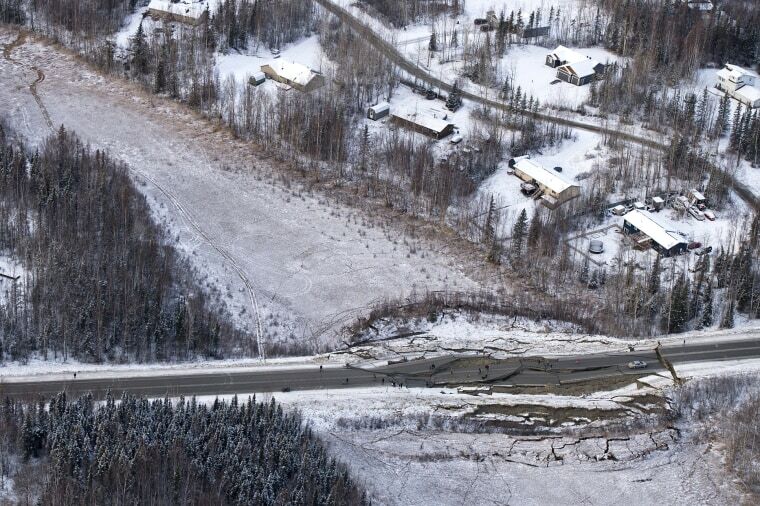 A day after a 7.0 earthquake jolted Anchorage and the rest of southcentral Alaska, nearly all systems have been restored, with much of the damage remaining in transportation infrastructure, according to local officials. "The Glenn Highway will continue to be the biggest challenge and the area of greatest concern for us," Anchorage Municipal Manager Bill Falsey told reporters on Saturday. The nearly 200-mile highway is the longest stretch of freeway in the state and was shut down on Friday and reopened on Saturday afternoon with delays. Falsey said that the quake produced nearly hundreds of aftershocks but the area's building codes helped structures there sustain the hit. "More than a dozen of the aftershocks have been greater than magnitude of 4 and five have been greater than a magnitude of 5," said Falsey, citing the Alaska Earthquake Center at the University of Alaska Fairbanks. "Every one of those in a normal course would have been a real 'no kidding' Alaska earthquake. So for a lot of people in town, this event has not ended," he said. As Anchorage recovers from the quake, called the most significant to hit the city since the 1964 Great Alaska Earthquake, which was a magnitude 9.2 and the second most powerful earthquake ever recorded worldwide, the city is preparing for a winter weather event. Between 4 to 6 inches of snow could fall in the Anchorage Bowl area, and in the hillsides 8 to 12 inches could fall. But high winds could cause power outages. "Having just cleaned up the earthquake, we should get ready for another ride due to the wind," Falsey said later Saturday afternoon. "This is the second largest earthquake we've had since 1964, this was a very significant earthquake," the city's mayor, Ethan Berkowitz, said on Saturday. "But in terms of a disaster, I think it says more about who we are than what we suffered." "Anchorage is prepared for these kind of emergencies. ... People pulled together, we followed the plans that were in place, we looked after one another," he said. "When people around the country and around the world look at this, they're going to say 'we want to do things the Anchorage way' because Anchorage did this right."